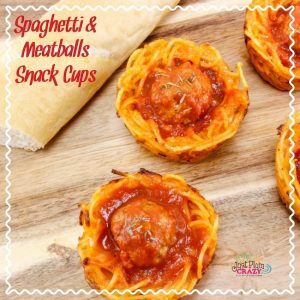 Spaghetti and Meatball Snack Cups Recipe | Be Plum Crazy! 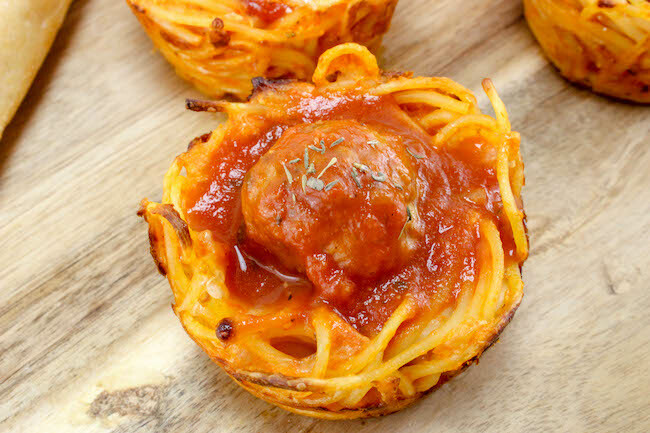 The Spaghetti and Meatball Snack Cups Recipe is brought to you by Just Plum Crazy. 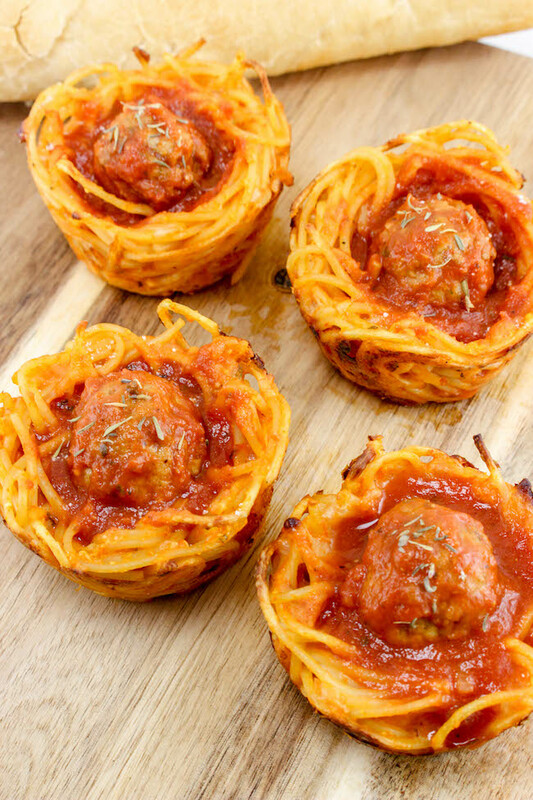 Spaghetti and Meatball Snack Cups Recipe! Earlier today we shared a cold Pizza Pasta Salad recipe and now have Spaghetti and Meatball Snack Cups recipe that is perfect for the kids after school or when you’re in a hurry. We will have another spaghetti and meatball recipe later today and I think the kids will enjoy it. 2. Cook spaghetti until al dente, drain, rinse in cold water. 3. In a large bowl, combine spaghetti, eggs, both cheeses, and 1 cup marinara and mix well. 4. 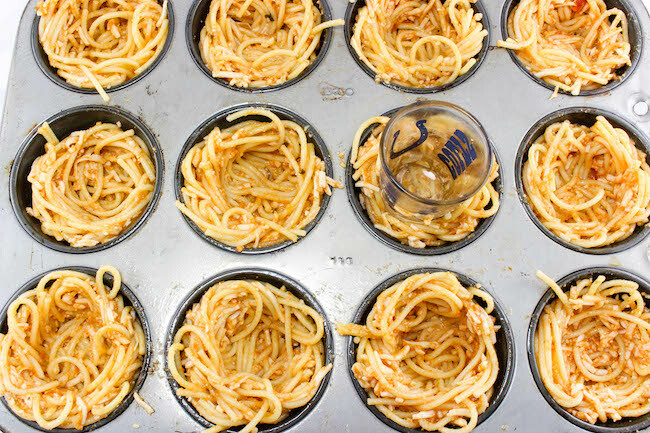 Spray a muffin pan with cooking spray and put a scoop of spaghetti in each tin. 5. Using a shot glass or small glass, press firmly down to create a well. 6. Bake until set, about 15 minutes. Let cool. 7. While spaghetti cups bake, cook meatballs according to package directions. 8. In a saucepan over medium heat, add the 1 ½ cups of marinara and heat until hot. Remove from heat, add meatballs and mix. 9. 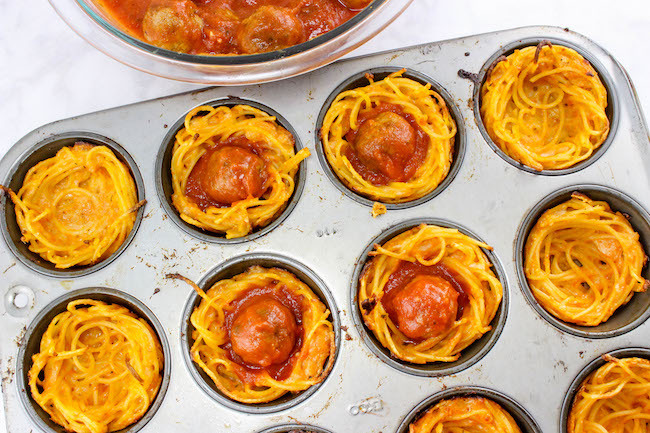 Add a little sauce and a meatball to each spaghetti cup. 10. Garnish with your favorite topping. Cook spaghetti until al dente, drain, rinse in cold water. 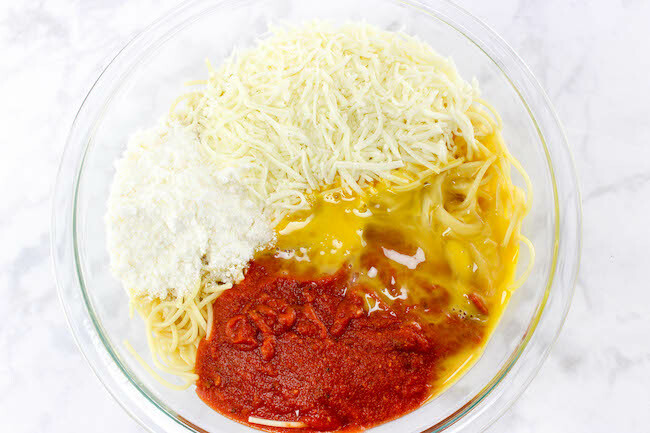 In a large bowl, combine spaghetti, eggs, both cheeses, and 1 cup marinara and mix well. 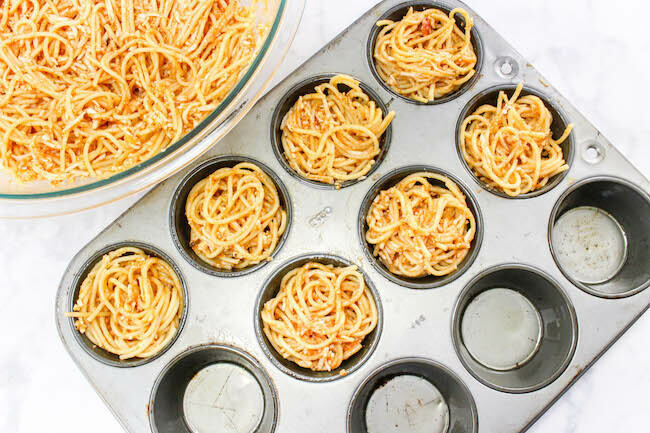 Spray a muffin pan with cooking spray and put a scoop of spaghetti in each tin. Using a shot glass or small glass, press firmly down to create a well. Bake until set, about 15 minutes. Let cool. While spaghetti cups bake, cook meatballs according to package directions. In a saucepan over medium heat, add the 1 ½ cups of marinara and heat until hot. 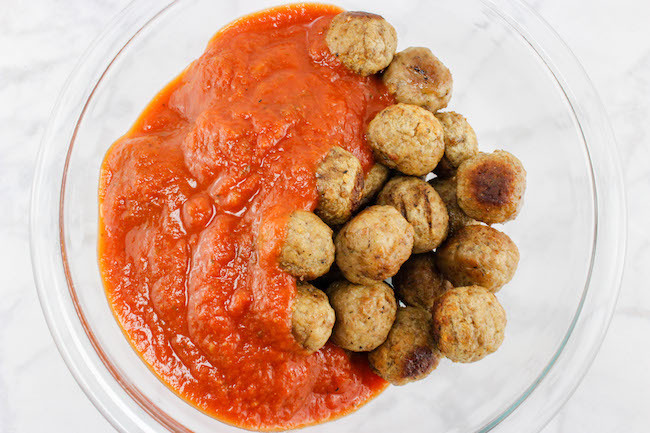 Remove from heat, add meatballs and mix. 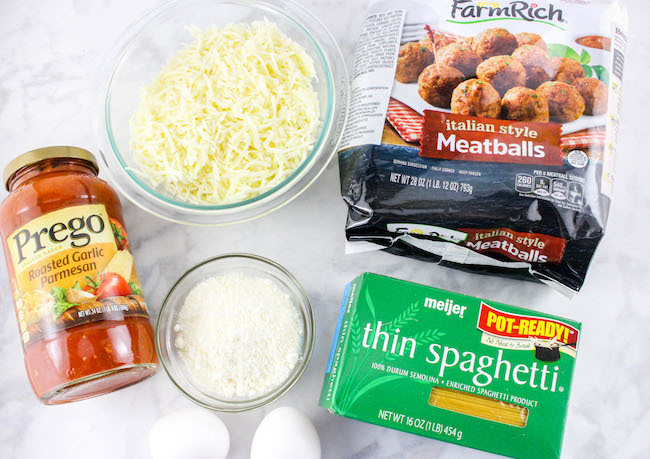 Add a little sauce and a meatball to each spaghetti cup. Garnish with your favorite topping.